Description of "PHARMA FIRST-LINE LEADER TO CEO: THE ROADMAP TO SUCCESS"
It not only shows the roadmap to success with a compass thrown in, but includes brief autobiographies of four eminent persons from the Indian pharmaceutical industry who have risen from medical representatives to managing directors / CEO’s. These autobiographies will be a stimulant to every pharma first-line leader or a medical representative who aspires to rise to the top. Of course, everyone may not become a managing director or a CEO, but certainly all can aspire to rise to other top positions like general managers or vice-presidents. Any reader is free to contact the author on e-mail (given in the book) for guidance or even mentoring. “PHARMA FIRST-LINE LEADER TO CEO: THE ROAD MAP TO SUCEES” is a must read for all those in the sales and marketing in the pharmaceutical industry, whether in India, Sri Lanka, Nepal, Bangladesh, Pakistan, Myanmar or Vietnam. The author, Prof. Vivek Hattangadi has put in over 30 years in the pharmaceutical industry, beginning his career as a medical representative, later working in brand management and rising to the position of Head of Sales and Marketing in India’s topmost transnational pharmaceutical house. "The Enablers" specializes in pharma brand management & training brand managers, and field sales managers for the pharma industry in India, Nepal, Bangladesh, Sri Lanka, Myanmar and Vietnam. Prof. Vivek Hattangadi has already trained over 10000 medical representatives, pharma field sales managers, brand managers and corporate managers. Prof. Vivek Hattangadi has already authored one book in 2011, “WHAT THE PHARMA CEO WANTS FROM THE BRAND MANAGER” which is a big hit with the pharma brand managers. Prof. Vivek Hattangadi is also into academics and is a guest faculty / external examiner in many business schools in pharmaceutical management. He is in the advisory board at CIPM, Kolkata. He was responsible for writing the curriculum and the entire study material (for sales and brand management) for the MBA course in pharma management, Vidyasagar University. He can be contacted on vivekhattangadi@theenablers.org / vivekhattangadi@yahoo.co.in. 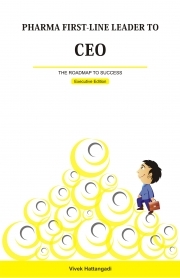 Reviews of "PHARMA FIRST-LINE LEADER TO CEO: THE ROADMAP TO SUCCESS"